Wonton noodles (pinyin: Yúntūn miàn; Cantonese Yale: wàhn tān mihn, sometimes called wanton mee ("wanton" is a Cantonese word for dumpling while noodles in Hokkien is "mee" or in Cantonese, "min") is a Cantonese noodle dish which is popular in Guangzhou, Hong Kong, Malaysia, Singapore and Thailand. The dish is usually served in a hot broth, garnished with leafy vegetables, and wonton dumplings. The types of leafy vegetables used are usually kai-lan also known as Chinese kale. Another type of dumpling known as shui jiao is sometimes served in place of wonton. It contains prawns, chicken or pork, spring onions with some chefs adding mushroom and black fungus. In Hong Kong and Guangzhou, wonton noodles are usually served in steaming hot soup with shrimp wontons and garnished with leafy vegetables. There are plenty of variations of this popular Cantonese dish, with different toppings and garnishes. For example, the soup and wontons in a separate bowl, the noodles being served relatively dry, with the toppings and garnishes, dressed with sauce, dipping the noodles in the soup to eat it. There are four distinct features: First, the wontons are predominantly prawn, with small amounts of minced pork, or no pork at all. Second, aficionados will insist on fresh, smooth thin noodles which are al dente, free from the taste and odor which is characteristic in many egg noodles when cooked. Third, the bouillon is light brown (prepared from dried flounder) and is usually steaming hot. Lastly, garlic chives are used as a garnish. The first two give the dish a wet but crunchy or crispy mouthfeel. The last two give the dish a unique bouquet. In order to ensure that the noodles are perfectly al dente and free from "noodley" taste, the cooking process and sequence must be meticulously adhered to. The wonton is cooked first, and then placed in the bowl. The noodles are blanched for only 10 seconds, after which they are rinsed under cold water and placed in the serving bowl. Piping hot bouillon is then scooped into the bowl, on top of the wonton noodles. The bouillon must be tasty, yet not so strong as to overpower the delicate taste of the wonton and the noodles which it is meant to accompany. When served, the spoon must be placed at the bottom, with the wontons above the spoon and the noodles on top. Because if the noodles soak in the soup for too long then it will be over cooked, this is strictly adhered to by the best wonton noodle establishments. 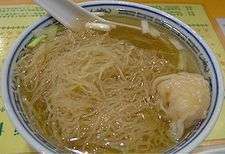 Although the "wonton noodle" is synonymous with wonton and noodles served in piping hot bouillon, the dish may also be served "dry", as in lo mein (撈麵), where the wonton are placed on a large bed of noodles. Malaysia offers different versions of the dish, with different states having different versions of the dish and there are versions from Johor, Pahang, Perak, Penang, Sarawak, and Selangor. The Malaysian version differs from the original in having slices of char siu added to the dish, as well as the possibility of the soup and wontons in a separate bowl, the noodles being served relatively dry, dressed with oyster sauce and garnished with chopped spring onions. Some stalls include deep-fried wontons in the dry versions as well. Often served dry, the Hong Kong version can be found at Cantonese noodle joints with it being dry or soup. In Malacca, wontons are placed together with the noodles and wonton soup can be ordered separately. The Malacca version is also usually spicier than the other Malaysian versions due to the use of a special unsweetened chili sauce. Vegetarian Wanton Mee also served in Malaysia in vegetarian restaurant. Instead of using pork to make Char Siu, wheat gluten is used. The Singaporean version of the wonton noodle is somewhat similar to the Malaysian version, though it uses significantly less soya sauce and is often served with chili ketchup. There are three distinct types of wonton noodle dishes found in the country. One would be pancit mami, which is a noodle soup that has egg noodles, wontons, and various vegetables in a hot broth. Another type would be pancit molo, which is similar to pancit mami, but the "noodles" used in the dish are the wonton wrappers themselves. A third type of wonton noodles are stir-fry egg noodles sold by hawkers and in small "stand-up" type stalls. Here, the noodles are stir-fried with mung bean sprouts and vegetables, flavored with a range of sauces, and finally topped with wontons. Singapore wonton noodles includes noodles, leafy vegetables (preferably cai-xin), barbecued pork (char siu) and bite-sized dumplings or wonton. It is either served dry or in soup form with the former being more popular. If served dry, the wontons will be served in a separate bowl of soup. Shui jiao or prawn dumplings are served at some stalls and the original Hong Kong version is available at Cantonese restaurants and noodle joints. Fried wontons (wontons deep fried in oil) are sometimes served instead of those boiled in the soup. Wonton noodles (Thai: บะหมี่เกี๊ยว; bami kiao) are also very popular in Thailand, where, as in Malaysia and Singapore, the dish is often ordered together with barbecued pork which is then called bami mu daeng kiao (Thai: บะหมี่หมูแดงเกี๊ยว; mu daeng meaning "red pork"). As is customary with many noodle soups of Chinese origin in Thailand, chillies preserved in vinegar, dried chilli flakes, sugar, and fish sauce are added to taste. The dish is mostly eaten in soup form but it can also be served dry with the broth on the side. Wikimedia Commons has media related to Wonton noodle. ↑ Chan, Hoishan (26 December 2011). "Best wonton noodles in Hong Kong". CNN Travel. Retrieved 28 October 2012. ↑ "Mak's Noodle Hong Kong". legourmet.tv. Retrieved 28 October 2012.